One Stop Mobility offers scooter rentals to accommodate users with a variety of needs. For example, our transportable model offers easy transportation because it can be disassembled and put in your car for quick mobility. Our standard scooters are most commonly used for all-day events where you will have to walk long distances. Our heavy duty scooters are almost the same as the standard, with the exception that it can carry up to an additional 100 lbs. And our extra heavy duty models can support up to 500 lbs but cannot be disassembled. If you need something that is lightweight and discreet, our transportable models are a great selection to choose from. We offer several different models based on availability, but the specs are just about all the same within this series. Our standard scooters are a great choice for using at fairs, inside Disneyland, around town when shopping, or anywhere else you would like. They cannot be disassembled quite as easily and quickly as a transportable so you will need to arrange a method of transportation when using these. The heavy duty models are almost identical to the standard with the exception of an additional 100 lbs that can be supported. 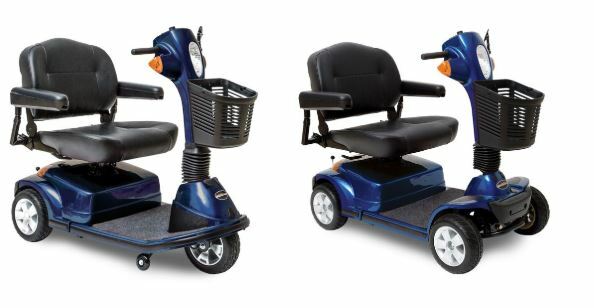 It comes with a reinforced body frame and larger tires, which adds for a smooth ride for the user. The extra heavy duty models carries up to 500 lbs and comes with a wide back, memory foam cushion seat. Designed for exceptional stability and performance, these scooters, make a great choice for rentals. * Driving distance may vary based upon individual user weight, driving terrain, battery charge, battery condition, and tire pressure.